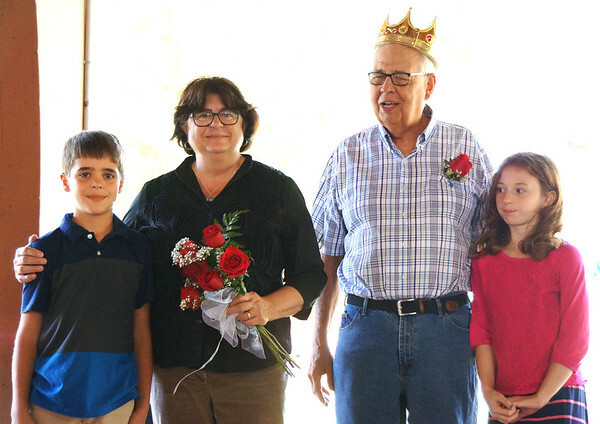 Queen Beth Meyer and King Ed Nobbe were crowned during the royalty pageant. They were nominated by their grandchildren, Luke Meyer (left) and Katie Nobbe (right). Luke Meyer wrote, "Beth Meyer is generous, nice, awesome grandma, friendly, welcoming and caring." Katie Nobbe wrote about her grandfather, "Every Thursday he will volunteer at St. Louis Bingo. He is on a food committee at the VFW and K of C. Whenever one of his grandkids has a game, he will go to watch."